Whenever I’m trying to write something, it helps to remember that most works go through stages of a creative process. Even something like this blog post—and I’m not saying I’m penning War and Peace here—follows a somewhat predictable series of steps. I never get what I’m after the first time through, as much as I’d like to. With a long, complex project like a novel, I especially have to keep in mind that I’m going to go through a lot of process. It helps to remember this, and to recognize what stage I’m in. I’ve posted about Louise DeSalvo’s excellent “Stages of the Writing Process,” but many other people have described how a creative work proceeds from the initial impulse through the finished form. The basic progression goes something like this: A project starts with some intimation, idea, image, hunch, object, experience or desire to bring something into being; it then evolves through a germination period as the writer or artist gets to work, going through drafts, sketches, and approximations in an effort to get closer to whatever the vision is. Perhaps he or she encounters technical problems or simply isn’t satisfied, without knowing what to do or how to “fix” the piece. The person may ask for feedback from others at some point. Often time must pass as the subconscious wrestles with the problem, and the artist simply has to wait. Eventually (God help us) the artist or writer comes to know what the piece wants to do and be, and is able to complete it. I find it helpful to keep this process in mind as I try to create something, be it a blog or a book. Doing so allows me to be more patient and accept that the time it takes to move through various stages is often necessary to bring a creative piece to fruition. the Whitney Museum of American Art, provided me not only an opportunity to view some of Hopper’s paintings and drawings, but also the opportunity to learn something about his creative process. It’s always interesting and valuable for me to see how the creative process works in another medium. The Hopper exhibit also reinforced the notion that in art the real or concrete is transformed by the artist’s (or writer’s) imagination—and process— into something new and different. That brought to mind something similar I had read about Georgia O’Keeffe’s creative process, which I’ll tell you about in a moment. 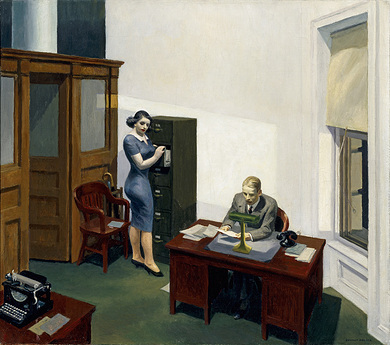 Because Office at Night is one of Hopper’s most iconic paintings, I’ll focus on that particular piece here. E. has his new picture drawn in charcoal. He is doing things with no end of preparation–had 2 brightly finished crayon sketches. Seems to seek delays for beginning a canvas. 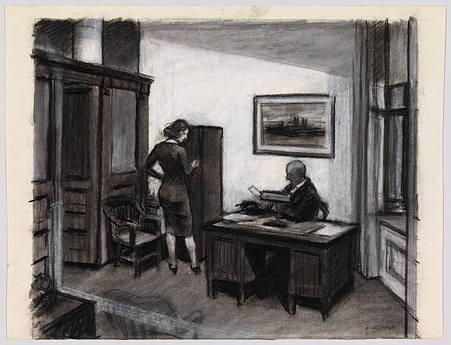 It’s a business office with older man at his desk & a secretary, female fishing in a filing cabinet. I’m to pose for the same tonight in a tight skirt–short to show legs. Nice that I have good legs & up & coming stockings. People read different narratives into Office at Night, which has about it something strange, mysterious, unspoken. The relationship between the two figures, the voluptuous woman in blue, and the man at the desk, provokes speculation and suggestion. The tilt of the painting, almost as if the room will slide off the canvas, is a brilliant touch. 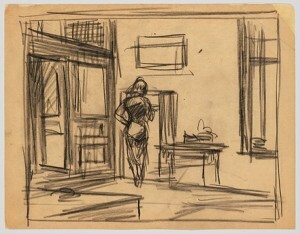 It’s interesting to note that in an earlier sketch, the floor is not at the angle depicted in the final painting. It seems to have developed through his drafts. The lighting is also worth noting. 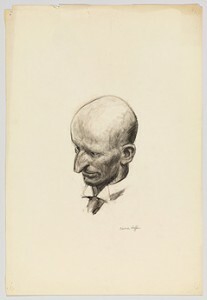 Wieland Schmeid, in Edward Hopper: Portraits of America, notes that as in other nighttime scenes, in Office . . . Hopper had to realistically recreate the complexity of a room lit by multiple, overlapping sources of varying brightness. In Office at Night, the light comes from three sources: an overhead light, the lamp on the man’s desk, which sheds a small puddle of intense light, and from a street-light shining in the open window on the right-hand side. Hopper reported that the overlap of the light from the ceiling fixture and the light from the exterior created particular technical difficulties, since they required him to use different shades of white to convey the idea of degrees of shadow. Reading about and viewing Hopper’s creative process in his drawings reminded me of something I had read about Georgia O’Keeffe in the “Introduction” to Creativity and the Writing Process, by Olivia Bertagnolli and Jeff Rackham. 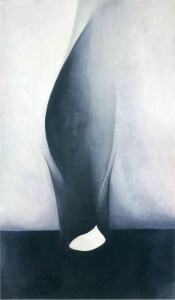 It’s fascinating to read what O’Keeffe described regarding the stages her own work progressed through as she moved from painting actual objects, through various drafts that didn’t satisfy her, to a period in which her subconscious worked on the problem, to a breakthrough in which her imagination transformed the original material into something new and more creatively satisfying to her. Analogies between the process of writing and the process of painting are not uncommon. Our own understanding of creative process may be clarified by American artist Georgia O’Keeffe’s journal description of her particular process written after she had worked on a series of paintings titled Shell and Old Shingle. As writers collect experiences, artists collect objects. Georgia O’Keeffe gathers bones, rocks, pieces of wood—all subjects of her paintings. Once, rather absentmindedly, she recalls, she picked up an old barn shingle and took it home where she placed it next to a clam shell. A few days later she noticed the shell against the shingle and began painting. She painted what she saw: the literal shingle and shell. Dissatisfied with the results, she painted the shingle and shell over and over, much as a writer might move through several drafts or revisions. But in each painting the shell remained a shell, the shingle a shingle; nothing emerged with any sense of spirit. Being the true artist, O’Keefe didn’t give up. After painting the shingle and shell a fourth time, she sensed herself moving beyond the literal subject and painted instead the imagined one. This time the shingle became a dark space floating above a white space. ‘The shapes,’ she writes, ‘seemed to sing.’ Months later, O’Keeffe painted a misty landscape of a mountain outside her window and realized sometime afterward that the mountain in the painting had taken on the shape of the shingle on the table. She had allowed the literal shingle and shell to become fictionalized by her imagination. Her early attempts to capture the literal material, conscious and controlled attempts, failed to satisfy her. The final painting was an uncontrolled, spontaneous act, the result of allowing the experience to incubate, and of having the patience and trust to allow the imagination to discover for itself the mountain in the shape of the shingle. A similar process happens to most artists—painters or writers—although never in quite the same way, even for the same person. The process cannot be hurried or forced or willed, but when the fictionalized memories of our experiences surface, when the image begins to sing, we must be ready. I find keeping Hopper’s and O’Keefee’s creative processes in mind as I struggle with the new novel I’m writing reassuring–and inspiring.